Figure 1-1. 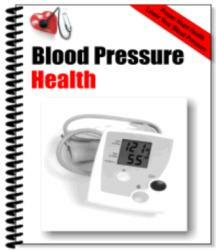 The patient is on cardiopulmonary bypass and cannulae are placed in the right superior and inferior venae cavae. 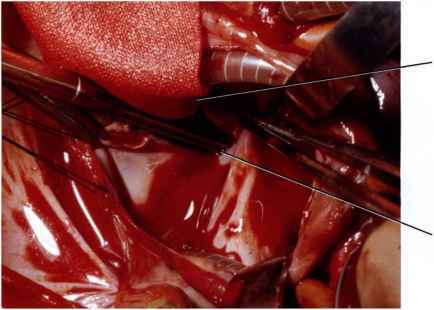 The right atrium is opened, and a large secundum atrial septal defect (ASD) is seen. 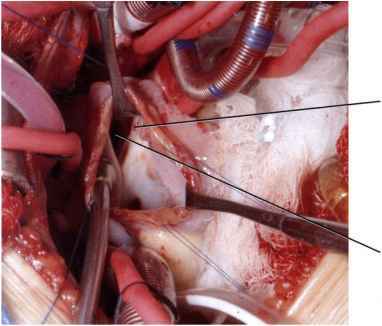 A third caval cannula passes through the ASD and is placed in the left superior vena cava, which enters the upper posterior wall of the left atrium. Figure 1-2. 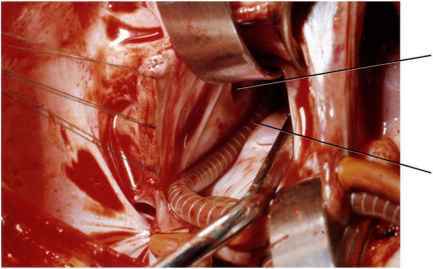 The atrial septum is retracted, and the cannula is seen at the orifice of the left superior vena cava. Figure 1-3. 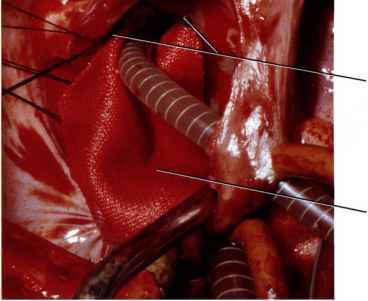 A thin, knitted Dacron® patch is stitched along the lower rim of the orifice of the left superior vena cava. Figure 1-4. 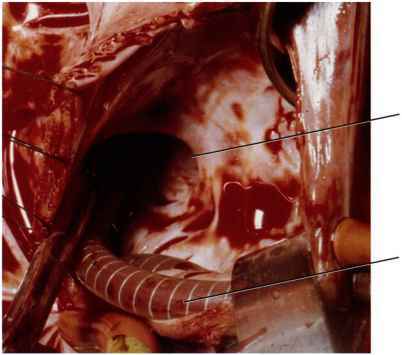 The suture is continued around the right and left sides of the caval orifice and then runs anteriorly toward the upper rim of the atrial septum. The patch is placed caudad over the atrial septal defect and will be stitched to the atrial septum to close that defect. Figure 1-5. 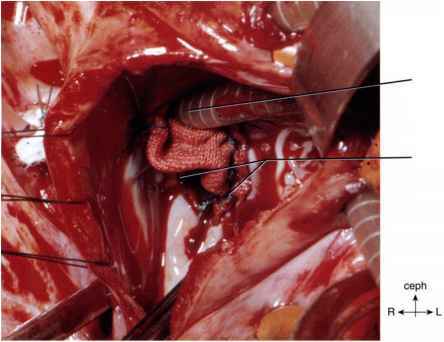 Using a continuous suture, the patch is stitched to the atrial septum at the site of the ASD. 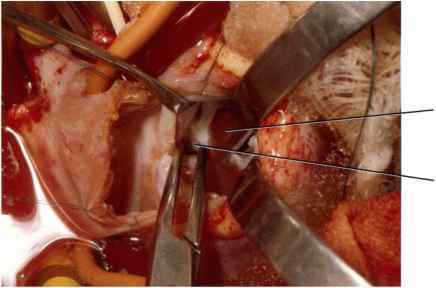 The atrial septal defect is closed, and drainage from the left superior vena cava is now diverted to the right atrium. Figure 1-6. The child has been placed on cardiopulmonary bypass and the superior vena cava is cannulated directly and remotely from the caval atrial junction. An atriotomy is made in the mid right atrium. The ASD is identified in the high lateral septum in the sinus venosus region. The right upper and middle pulmonary veins were seen draining to the left atrium immediately posterior to the atrial septal defect. The superior vena cava orifice is adjacent to the pulmonary veins in the left atrium.